Join us for a wonderful musical experience. Singer/songwriter Sarah MacLaine and Sagit Lourie in concert at LBC, for one night only! Welcome in the day of rest with our musical Shabbat service, led by Naomi & Adam. 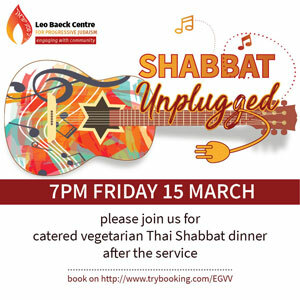 Join us for a tasty catered “Thai” vegetarian Shabbat dinner after the service. Bookings essential for dinner. 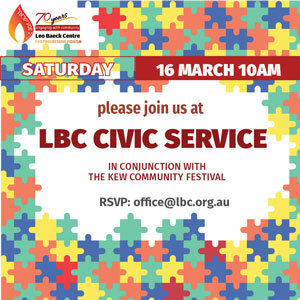 LBC welcomes visitors each year to its annual Civic Service, held during the Kew Community Festival. 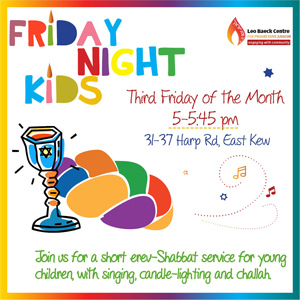 The Service celebrates Shabbat and LBC’s place in the local community. The Service will be followed by Kiddush. Please join us! Graggars, costumes, hamentashen and the whole megillah! 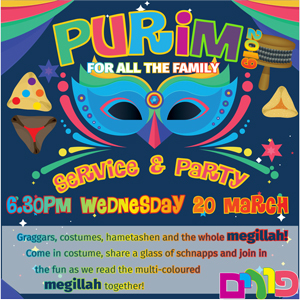 Come in costume, share a glass of schnapps and join in the fun as we read the multi-coloured megillah together. 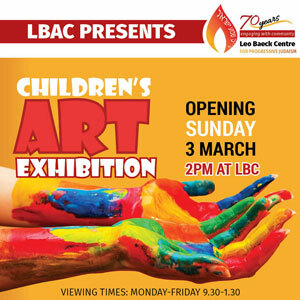 Join us for Leo Baeck Art Centre’s first-ever ‘Youth Exhibition’ where we will display a wide variety of art works by our younger members. Enjoy Jewish and popular music at our regular monthly Jewish Jam Session. Bring an instrument if you have one or your singing voice or just listen, and also a small note donation. No previous performing experience needed and sheet music is always provided.